So, at my old job there was a huge raven that lived in the back alley by the shop. You would see it eating pigeons, and occasionally you could hear it singing and whistling to itself in that doddering old man way that ravens have. This bird was so big I made jokes about it cornering people in the alley and stealing their wallets. Then, one frosty morning in October, I saw it perched on a dumpster. drinking a steaming large Tim Horton’s coffee. I drew this soon after my first year Cree course, so apologies if there are problems in the title. let me know what they are and I will fix them. Cree has the best word for raven, kahkakiw (something like “Caw-Caw-Keo”). Hey, remember last post when I said new things were coming? That was a lie, and this might be my last post in a while. 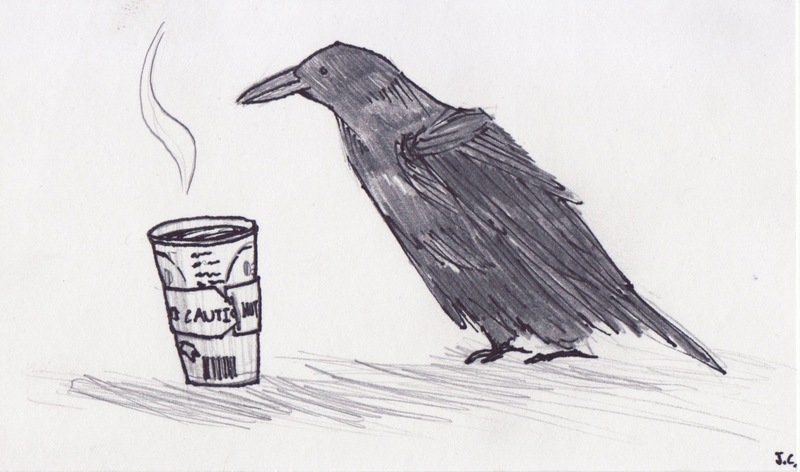 This entry was posted in Drawing, Index Card Series and tagged b&w, bird, caffeine, coffee, drawing, edmonton, paper cup, pen and pencil, pigeon, raven, tim hortons. Bookmark the permalink.